I will devote my first lecture to the opposition between lightness and weight and will uphold the value of lightness. This does not mean that I consider the virtues of weight any less compelling, but simply that I have more to say about lightness. – Italo Calvino, Six Memos for the New Millennium, Vintage International, 1988. Jean-Pierre Léaud: this figure, this presence, this symbol, this persona, this actor – a performer who is histrionic and naturalistic, transparent and opaque, pliable and inflexible. He is himself, he is his character Antoine Doinel, he is New Wave cinema incarnate, he is the past-in-the-present, the past remembered and re-evaluated. He is a symbol of the Sixties, he is an actor in his fifties. He provokes extremes of identification and irritation in his audience. He has had the experience of growing up in public – who else has done this so visibly, as both actor and character? This has had an effect on his audience – in particular, on those filmgoers able to follow his development chronologically: it is a strange kind of 42-Up experience to have seen Léaud, as the character Antoine Doinel, move from childhood to adolescence to adulthood in those five Truffaut films, to have followed his sentimental education over two decades. It begins in 1959, with Les 400 Coups; followed in 1962 with “Antoine et Colette” in L’Amour à Vingt Ans; then Baisers Volés (1968), Domicile Conjugale (1970) and concluding in 1979, with L’Amour en Fuite. Longer than that, if you accept that Antoine Doinel’s life on screen extends beyond the boundaries of Truffaut’s films – something that indicates not so much the limitations of Léaud as a performer, more the flexibility of the applications that this extended project has made possible. Kael, in her amiably dismissive,”is-that-all-there-is?” review, invokes in passing an audience for whom Léaud has particular meaning – and makes it clear she would never class herself with these mildly disappointing and disappointed types. She refers to “those for whom Jean-Pierre Léaud as Antoine Doinel has become part of their own autobiographies, with Antoine’s compromises and modest successes paralleling their own”. (3) She is characterising the events of Doinel’s life: odd jobs, anxious encounters with women, marriage and a child, the breakdown of the marriage, the publication of a book, the hope of a new relationship finally affirmed. Nothing heroic or grand, nothing substantial, she seems to be suggesting. There is a refrain among some reviewers to the effect that Doinel has turned out disappointingly, that we all expected more of him. He is too light, too slight, too trivial, a figure with insufficient gravity. Much of this must have something to do with that remarkable ending of Les 400 Coups. It’s one of those rare indelible moments – it’s hard to imagine that it could ever be forgotten. It hardly needs recapitulation. Antoine, having escaped from the reform school during a football match, runs through the countryside towards the sea, the sea he has never set eyes on before, into the shallows, then turns, faces the camera, freeze-frame. There’s something that both disturbs and accuses the viewer about this abrupt, suspended moment. It takes us backwards and forwards and nowhere, it haunts us. The later Doinel films, revisited, are neither as charming or as disappointing as they might have seemed at the time: there is a considerable anxiety and uncertainty running through them, a more self-conscious embrace of solitude and its disappointments, comic absurdity and its compulsions. They foreshadow, more than might have been clear at the time, the extent to which Léaud will take on the exploration of inadequacy, failure and despair. Even so, the Antoine of “Antoine et Colette” is something of a surprise after Les 400 Coups. He has turned into a dutiful, tentative boy. His vividness, his solidity, have softened – he’s a gentler, more compliant figure, physically more rounded and soft. At a distance from his father and mother, he cultivates other people’s parents. Fixated on a young woman, Colette, he finds himself spending more time with her parents than with her. In Baisers Volés he emerges, physically at least, as the Léaud we came to know in the Sixties: slighter, leaner, more dapper. There’s a publicity still which gives us an image of three in one: Léaud, from Baisers Volés, in a tweed jacket, shirt and tie, arms across his chest, eyes looking left, one eyebrow slightly raised, stands in front of a photograph of himself in “Antoine et Colette ” (arms crossed, shirt unbuttoned, eyes swivelled in the other direction) and this Antoine stands in front of a painting of himself in Les 400 Coups (eyes left again, the neck of his jumper pulled up, like a mask, over the bottom half of his face). The three faces of Antoine: not a Magritte, not a hall of mirrors, but an odd, disconcerting layer upon layer of the self, not contemplating itself but standing in front of itself. Not confronting the viewer, either, in the way the final image of Les 400 Coups does to such devastating effect. Instead, a sideways glance at something outside the frame. After L’Amour en fuite, Léaud did not make a film for five years. But in 1984 (the year of Truffaut’s death), after a period of what was apparently considerable emotional turmoil, Léaud made an extraordinary appearance in Paris Vu Par … Vingt Ans Après, in a short film, “Rue Fontaine”, directed by Philippe Garrel. (Its predecessor, the original Paris Vu Par … , was made up of segments from Jean Douchet, Jean Rouch, Jean-Daniel Pollet, Rohmer, Godard and Chabrol). Here, Léaud plays a character, René, who seems on the absolute edge of despair. Garrel himself appears, inducting René into the film and introducing him to a woman who for a brief time seems to offer him some hope. At the beginning of his encounter with Garrel, Léaud is huddled inside his coat, his right hand clenched protectively in front of him. He seems to be a character in the process of dissolution. He doesn’t have the sharpness that so annoyed David Thomson: at first, he seems to lacks definition almost entirely. He is an unravelling, down-at-heel figure: it is a performance that makes us think of both Antoine Doinel and of Alexandre in La Maman et la Putain (Jean Eustache, 1973), and of what might have become of them. In a café, he delivers an edgy, rambling monologue that is like a short history of Léaud the actor/persona, in which every gesture, every cryptic anecdote is freighted with pain, heavy with allusiveness … the only lightness in evidence is that sense of dissolution. Yet the Léaud who re-emerged in the Eighties will still be able to draw on lightness in a different way. In I Hired A Contract Killer (Aki Kaurismäki, 1990), shot in English, Léaud is Henri Boulanger, a Frenchman who has been working in a clerical job for 15 years, then is suddenly made redundant. He decides to kill himself – methodically and without self-pity, he goes out and buys a rope and a hook, neatly prepares a noose, puts it round his neck … and wakes up to find himself alive. The attachment to the wall broke. So, noose still around his neck, he crawls over to the stove and turns on the gas, thrusts his head inside the oven … and the gas goes out. (There has been a strike.) When he can’t succeed in killing himself, he hires a contract killer to carry out the job for him. As he waits in the bar opposite his flat for his killer (having left a note on the door about his whereabouts), Henri, on impulse, has a drink, buys cigarettes. He tosses back the whisky deliberately: his physical reaction, the sudden lift of his eyebrows, is an almost unbearably long-delayed response. The comic incompetence is given a touch of poignancy by Léaud’s characterisation of Henri, of his impassive sadness and feeling of fatigue. This is a man who says he does not want to live any more, and you are prepared to believe him. It makes the pretext both sadder and funnier at the same time. When Italo Calvino wrote his lecture on lightness for Six Memos for the Next Millennium, he described a scene from Ovid’s Metamorphoses in which Perseus, carrying Medusa’s head, puts it down for a moment, resting it on a bed of coral. It’s the importance of both Perseus’ gesture and Ovid’s observation of it that Calvino draws our attention to. In a less dramatic sense, thinking about Léaud inevitably involves thinking about gestures. Few actors carry with them such a clear, familiar repertoire of gestures, movements, ways of speaking, declaiming. There’s one gesture, above all – an emphatic movement of the hand, the forefinger jabbing the air, making a point – which first registers, briefly, in Les 400 Coups . There’s another with the left hand, palm open, used more often to indicate denial, the negative. You could compile a field guide to Léaud. The smoothing back of the hair. The blink. A look, eyes glazed, concentrated, staring into a space immediately in front of him. A purposeful way of walking, leaning forward, in profile, crossing the screen from one side to the other that is Roadrunner-like in its single-minded determination. These gestures have a strange life of their own, a characteristic pace and rhythm: sometimes a somnambulistic quality, sometimes incorporated into a frantic routine, a demonstration of Léaud as an accomplished physical comedian. As an actor, he is active, an approach that elsewhere often denotes a kind of ingratiating, “watch me!” relationship with an audience, a desperate grab for attention and love. But with Léaud, it’s a different story. Often, his performance (that is, his character’s performance) seems to be for himself, certainly not for the spectators. For the camera, perhaps – for the cinematic process itself. Léaud, the actor, lets us observe a character’s private, self-examining rituals. There’s a strange mixture of generosity and narcissism, risk and repetition in this approach. It makes possible the more vulnerable, devastating performances. Léaud’s delivery of lines can be mannered: sometimes he seems to be almost reciting, as if drawing attention to the fiction at the heart of performance, the illusion that he is a character saying what he thinks. But it’s also a trait that in a strange way I find myself linking back to Léaud’s earliest work – to a scene in Les 400 Coups in which Antoine, at home by himself, reads Balzac’s story La Recherche de l’absolu. He draws the story into himself, he takes pleasure in its qualities. It’s as if, in taking it in, he feels as if he has also made it his. So he repeats the story in an essay which is supposed to be about something he has actually experienced. For this he is denounced as a plagiarist and soundly punished. It’s not just that a world of the imagination seems real to Antoine. It’s as if this incorporation and recapitulation is somehow a foreshadowing of the way Léaud occasionally seems to deliver lines – as if a character is speaking words that were not his, but that he has in a way made his, has absorbed, processed and projected them back out again. It seems mechanical and impersonal, and yet in its certainty and intensity it also feels deeply personal. The complexities of the Godard-Truffaut relationship – cinematic and personal – are far outside the scope of this piece. But it’s worth noting that Leaud was an actor whom these directors could struggle over, and that here he is being treated as a symptom, a pretext, a litmus test. Léaud is supposed to have said that Truffaut was his father and Godard his uncle, which sounds very cosy – but if this meant that Truffaut and Godard were therefore brothers, then at this particular point they exhibited the fraternal spirit of Cain and Abel, the family values of the House of Atreus. But it is the fact that is possible to watch Leaud in both those ways – affectionately, and with scientific detachment – that makes him such a powerfully interesting performer. His performances don’t invite identification: yet they compel it at the same time as they keep it at a distance. And his strongest performance is undoubtedly a painful experience, of the most riveting kind: his role in La Maman et la Putain. In the film that Eustache wrote and directed, Léaud is Alexandre, a man in his twenties living with an older woman, Marie (Bernadette Lafont): he has no job, but occupies himself with the business of occupying himself. At one point he decides that he will treat his visits to a cafe as his equivalent of a working routine. This is a loquacious but in some senses extremely restrained representation: the gestures are at a minimum, Eustache often shoots him in shadows, or from behind, and frequently it is the gaze, fixed on the person he is speaking to, that reinforces the dialogue. There are a few (only a few) moments where Alexandre shows a conspicuous tenderness and gentleness – the gesture of a hand on the shoulder, a lively interest in a question and its response – that make him seem likeable. At first, it’s a film which seems to revolve around Alexandre, but gradually he loses his centrality, his command, any semblance of authority. Leaud’s performance – in which his character gradually finds himself out of his depth, devastated, in which a carefully constructed masculinity proves insufficient to the messy demands and challenges placed on it by two women, Marie and Veronika (Françoise Lebrun) – is painful to watch, but it’s also fascinating to see him going quietly, as it were. He has less and less to contribute, in an overt sense, to what is going on in the film. It’s this withdrawal that is so powerful. The final image is of Alexandre, having been confronted by Veronika (“You’re despicable, I love you, I may be pregnant by you”), sitting on the floor in her room, while she vomits into a basin. She tells him to look away, not to watch her. He cannot look at her, and he has nothing to say. It’s impossible to imagine where to go from here. It’s a film that undoubtedly has much to say about “1968” and the New Wave – it’s often hailed as a sort of denunciatory epitaph for the political, social, sexual, cinematic revolution that both did and did not take place in France. But its power, I think, stretches far beyond the local, topical, historical references. It’s a film which puts us through raw and hopeless vision of the relationships between men and women. It is as harrowing to watch now as it was in the Seventies, and it shows Leaud prepared to take his character to a point of absolute numbness and despair. Thirty years later, in Pour Rire! (Lucas Belvaux, 1997) that musical question – “Who cares for a love that’s died?” – could be posed once more. 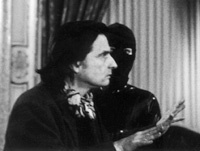 In this film, Léaud is notably restrained: he’s a character, Nicolas, who discovers that his wife Alice (Ornella Muti) has a lover, and takes drastic action: he befriends the lover, Gaspard (Antoine Chappey) allowing himself to be saved by Gaspard from suicide, and becomes his confidant, receiving confidences about the affair, manipulating his progress. Léaud is funny and melancholic, devious and diverting. Pour Rire! is a comedy that occasioned an eloquent tribute in Cahiers du Cinéma from Jean-Marc Lalanne (10) , a tribute not only to the immediate charm of Léaud’s performance, but to the history that is incorporated in it – a history that is both well-worn and worn lightly. 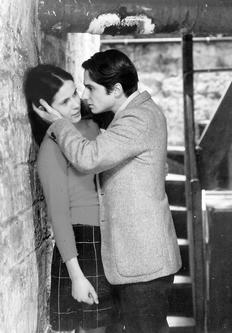 The film contains several moments that echo scenes or attitudes in other films in which Léaud has appeared, particularly the Doinel series: Nicolas saying that he’s read in Elle that the women men leave other women for are always uglier than the first women – a very Doinel-like source and observation. Nicolas and Alice sitting up in bed together, like Christine and Antoine. Nicolas’s aikido, reminiscent of his Japanese obsession in Domicile Conjugale. But, most obvious, the major nudge in the ribs – when Nicolas visits a friend in hospital, he says to one of the nurses, “Haven’t I met you before?” She denies it. But the nurse is played by Françoise Lebrun, who gave that extraordinary performance as Veronika (also a nurse) in La maman et la putain, and it’s disconcerting here to see it referenced so cheerily. This is a Léaud who made films with Godard (more than with Truffaut), who has worked with everyone from Pasolini to Rivette to Eustache, who goes on to work with Cathérine Breillat and Olivier Assayas, Philippe Garrel and Aki Kaurismäki. Certainly, he’s been cast because of who he was and where he has been, and directors who have used him have wanted to explore or employ the history he carries with him. It’s a history inscribed in him, in the way he expresses himself physically, in the way he utters lines. In Les 400 Coups, the cinema was somewhere both sanctioned and forbidden for Antoine – somewhere he visited covertly, as well as the place where he and his parents were, on an outing, able to impersonate a happy family. Léaud as an actor has been associated in a particular way with cinema, with directors – in some way a surrogate for directors, as well as an actor who has played the role of a director. In Last Tango In Paris (Bernardo Bertolucci, 1973), Leaud played a character, Tom, whom Bertolucci seemed to treat as a New Wave Aunt Sally, obsessively filming the woman he loves, looking a little foolish and insubstantial against the weight and gravity of Marlon Brando. In Irma Vep (Olivier Assayas, 1997) he played René Vidal, a director obsessed with a woman, a director remaking, in black and white and in silence, Feuillade’s 1916 Les Vampires. Vidal has cast Maggie Cheung (playing an actress who shares her name and her career) as the villainous and beautiful cat burglar. Vidal’s career is in eclipse, he needs a hit, yet he has chosen a subject and an approach that is almost impossibly perverse, and has cast a leading lady whom he fell in love with while watching scenes that were shot by her stunt double. (Cheung tells him this, but he doesn’t take it in. It doesn’t make any difference to what he wants or what he knows.) He’s obsessed and fearful, a vulnerable yet dogmatic character: Léaud plays him with a kind of haunted frailty, as someone who will both fail and succeed, who is misguided and inspired. Someone whose life is intimately and intricately bound up with cinema, who can simultaneously conjure up and erase the thing that he loves. It’s disappointing to see Léaud presented in this way, as if he were a former child star who’s kept dabbling in the movies: as if the sum of his work can be reduced to a sum on a blackboard. For an actor who has explored, in a unique way, issues of identification and performance, whose body of work seems to be constantly redefining itself in relation to what has gone before and from whom we can still hope for so much, it seems almost contemptuous to put him in this position. But the man posing for the picture – a little thickset, sitting on a stool, bracing himself against a desk, looking as if he is on the point of getting up and leaving – doesn’t seem to care. His mouth is turned down, and he gives the camera the strangest of stares, one eye open, one narrowed. He is not comfortable where he is. And we would never want him to be. Comfort is the last thing he would want to offer us. Léaud the first, Cahiers 509, Jan 97, pp 82, translation mine.